In the last week of the school holidays, four small people packed their bags, filled nanny’s little car with car seats & tiny bodies, and abandoned me to four days of hysterical sobbing & loneliness. Somehow, I managed to dig deep, wipe the tears from my eyes and make a list. A LONG list. Four whole days to myself! Where to start? With a celebratory boogie, perhaps? (I did manage to hold myself back on that one). It likely goes without saying, at this point, I have somewhat of a reputation in these matters. Not that I have chopped anything off (nor sustained any major self-inflicted injuries), but I do have the grace & co-ordination of a newborn giraffe. Actually, that’s probably an insult to baby giraffes. I make baby giraffes look like gazelles. Step two – my panel was larger than I needed, which worked in my favour as I intended to use it for the children’s art space as well. To cut to size, I used the very technical method of counting the holes to find the row of holes in the middle, & using a straight edge to run a line along it. A hand saw made reasonably quick work of cutting one panel into two 600 x 900 pieces. The saw wobbled a bit, but I wasn’t overly stressed because the frame would hide any not-quite-straight parts. final coat (which I could do straight away again), I went a bit thicker, and worked in long strokes all the way across the long 900mm side to give me a nice smooth finish. Step three part two – my super-thin first coats weren’t solely for the purpose of reducing/eliminating drying time. My biggest concern was that too much paint on my brush would lead to clogging of the holes, or even just ugly ridges where paint might accumulate at the edges of the holes. My concerns were justified on this final coat, with a few of the holes clogging. A couple of them I could clear with a short sharp breath, but a couple I needed to use a pen to poke the paint out. Watch for holes being painted over so you can clear them as soon as possible. Step four – paint the frame. Since both projects I would be using the framing for called for the same colour, I painted all three lengths at the same time – an undercoat, then one coat of Dulux Happy (which in the brightness of my studio isn’t quite right & I will be changing it when I get around to doing my floor). Paint purists can rest easy, I painted these in a more traditional, wait-for-each-coat-to-dry fashion. Step five – to cut the framing, the mister (who was home by this time) & I wrangled the drop saw into the work area (that thing is a serious chunk of machinery), and, for a change, I erred on the side of accuracy, and actually measured my pegboard. One of the short sides was a couple of mm shorter, so we went with the longer measurement, and then, of course, Beetle woke up and demanded My Mama And No-one But My Mama. Of course. So the mister got to cut the frame. Booooooo. Upside was I could stand and project manage & got all my framing cut at once. Step six – because I couldn’t get rebated timber for the frame, it is just attached on the outside. I could’ve used a router to add the rebate, but meh. I was working to a deadline! My very technical measuring of screw hole position involved holding the board against the wall, eyeballing the level, and using a pen through the corner peg holes. My studio walls are brick, so I used a hammer drill to drill four holes & hammer in a green plug. If you are mounting onto a plaster wall, be sure to check for studs to attach your board to. The screws don’t need to be exactly in the corners, as long as they are near one edge, so they are covered once the frame goes on. Step seven – to hold my board away from the wall so I had enough room to actually hang the pegs, I used an off cut of my framing in each corner, and pre-drilled a guide hole. I started the screw for each corner while I had the board & spacers laying flat on the floor. I did it in the studio because I am not precious about the soon-to-be-replaced floor, but this is likely best done in a workspace for if & when the screw goes a bit too far through. Step eight – the board is small & light enough to be handled by one person, so I was able to shift it into position, lining up the screws with the green plugs. Once one of the top screws was firmly in place, it pretty much supported itself while I screwed in the other three corners. Step nine – using small tack nails, I lightly tacked the frame in place with one nail in each corner, starting with the bottom piece. Once it was in place, it offered some support to the sides and the top, which I could hold in place roughly enough to check my mitres were lining up to tack into place. I then stepped back to check they actually were butting together nicely, and finished hammering in those nails, and added a second to each joint to secure it properly. Step ten – with the frame in place, I then added the second coat of paint to finish it off. To put my pegboard into use, I grabbed a mixed pack of pegs from Bunnings. The rack at the bottom holds all my clear mount stamps, and it is also from Bunnings. The buckets I found at the local cheap shop – one holds some metal stamps, the other some small clothes pegs that didn’t have a home elsewhere. The rest are empty for now. Once everything was up, there was a bit of bare space to the right, which I filled with two clips that I had on hand, to hold a couple of cute Project Life cards. The final touch was a key ring from Disneyland Paris. I’m still fiddling a bit with what tools live where, but this little project has made such a difference already to the organisation of my creative space. This looks amazing. I think I need one too. Thank you! I’m so happy with how it turned out, and it really is super easy to do – can’t wait to see how you customise yours! YES! 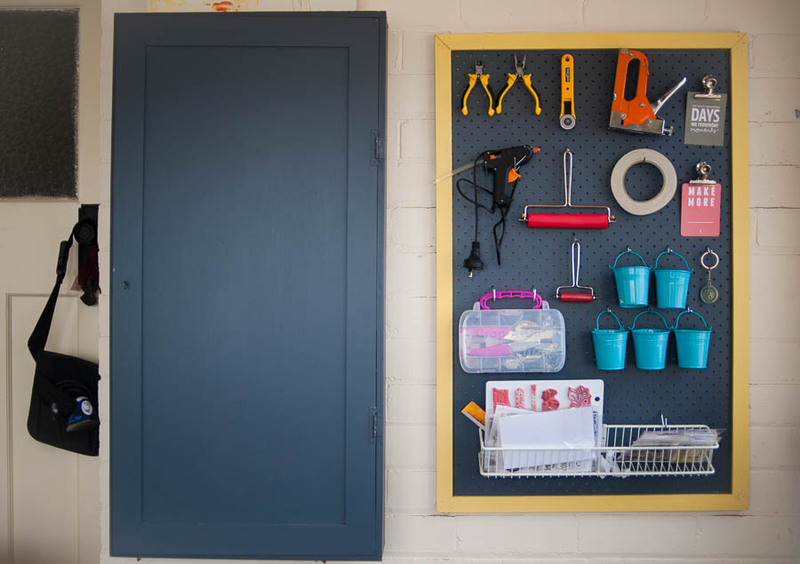 I’ve always wanted a pegboard, but have never made it happen. Thanks for sharing this DIY. I love how this version is framed and portable. Thank you! It really is very easy, do share if you get around to making one! Bunnings, Ute – Aussie or Kiwi?? 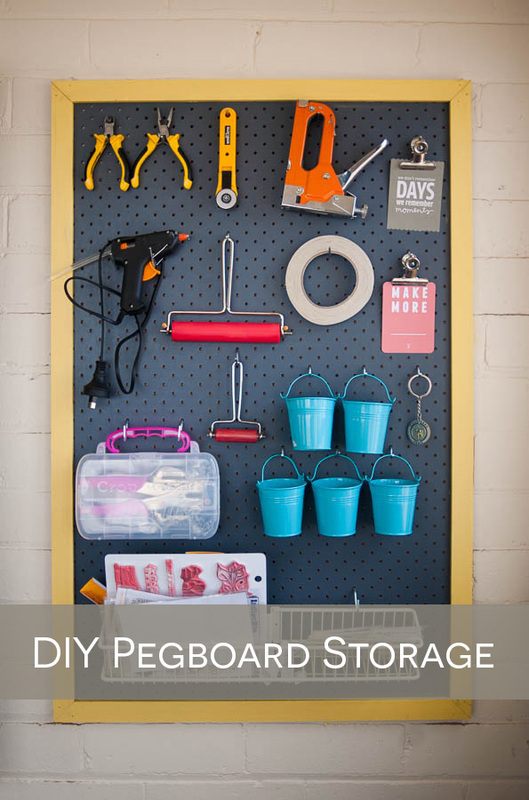 I love this idea – not sure if I have the wall space – but am thinking I may just put Peg board at the back of my shelf units to get more storage space out of them! Aussie! You could always shrink to fit? Or the back of shelves is a good idea – even the sides of the shelves? I’ve stuck 3M hooks on bookcase sides before to add hanging storage!